LIMITED SUPPLY AT THIS PRICE! Full 1 Year Warranty! - Ships Fast! We Have Sold Thousands of These High Quality 3 Track USB Credit Card Readers / Swipers Since 2007! This is Our BEST Selling Computer Card Swiper For ALL Windows & MAC Computers. Also Works on Microsoft Surface Tablets with Full Windows Operating System as well as Chrome Books! In Addition to Credit Card Processing, This Reader Can Output the Data to any Excel, Word, Notepad, Other Document or Web Page Field With NO Additional Software Needed! Just Swipe Any Card Through The Reader and The Data Flows Into The Document - Then Copy and Paste The Data Into Your POS Software or Virtual Terminal! Long lasting and durable rated for over 1,000,000 swipes! Full 1 Year Warranty! - We Have Sold Thousands of These High Quality 3 Track USB Credit Card Readers Since 2007! Also Works on MAC Computers and Chromebooks! You Can Also Swipe The Data Into a Document or Excel Spreadsheet and Then Copy and Paste The Data Into Your POS Software or Virtual Terminal! With the USBSwiper Credit Card Terminal, you can turn your computer into a credit card processing POS System when used in conjunction with compatible merchant accounts or software platforms. If your current credit card processing software and /or merchant account provides software or has a virtual terminal that is compatible with a keyboard emulation 3 track USB interface reader, then our credit card reader will work. If you do not see your merchant account or software platform listed below, please check with them as to compatibility. BELOW IS ONLY A PARTIAL LIST OF COMPATIBLE MERCHANT PROCESSING COMPANIES OUR CARD READER WAS COMPATIBLE WITH AT THE TIME THEY WERE ADDED. SOMETIMES COMPANIES UPDATE THEIR PLATFORMS AND IT IS POSSIBLE THAT THE CARD READER MAY NO LONGER BE COMPATIBLE. PLEASE CHECK WITH YOUR PROVIDER AND ASK THEM IF A 3 TRACK KEYBOARD EMULATION NON-ENCRYPTED CARD READER IS COMPATIBLE WITH THEIR SYSTEM. If your merchant account provider is not listed above, please check with them to verify that a 3 Track Non-Encrypted Keyboard Emulation Credit Card Swiper will work with their merchant account system and /or their virtual terminal as there may be a software they need to provide. If not, we offer many low rate merchant accounts that do work with this type of reader. Please call us at 224-677-0283 for more information. BUY NOW - ADD TO CART! Dear USBSwiper! I want to say that the software and USBSwiper were a success for our event. Through the initial installation with your tech support help, we were able to set up the software on all three computers being used. Your tech support help as well as the helpful video tutorials on your website allowed us to personalize the invoice to our specifications and create a very professional looking receipt for our auction buyers. We had a successful check-out thanks to the user friendliness of the software and the ability to swipe credit cards at our event. 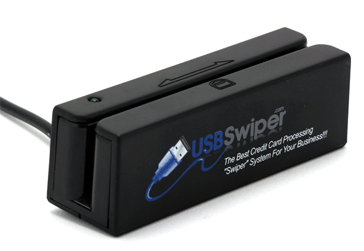 We look forward to using USBSwiper for credit card processing at our future events! Why am I a Big Fan of USBSwiper? I own a small dress store located in an old barn in a small town in Midway, Texas. I am only open on Saturdays from 10-4 but people drive from all over Texas to shop here on Saturdays. Over the past 10 years the store has kept growing bigger and bigger and I had no way to accept credit cards without going through a major hassle with a bank set up. I have had a Pay Pal account for many years and a couple years back I found USBSwiper and saw that they were offering a way for merchants to accept credit cards and have the money go right into my Pay Pal account. I was very excited and started looking more into the USBSwiper plan right away. Where USBSwiper shines is in their unparalleled customer service. USBSwiper is quick, easy and perfect! I have no problems with my USBSwiper. Swiping the cards increased my sales by nearly double. Before, I had to type in names, addresses, card numbers, etc into Pay Pal for each transaction and it took forever to check a customer out, so this also saves me a lot of time. I used the extra time to build a small web site for the store, www.thesecretsalebarn.com. My thanks to everyone at USBSwiper for making such a helpful product. I recommend it fully to everyone who asks me. I own and run The Secret Sale Barn, 17509 OSR in Midway, Texas. My name is Katherine and you can write me any time at csrsupport@aol.com if you have any questions about how wonderful this product is. Better yet, come to Midway, Texas and see it in action! We would love to have you visit the barn!